49574	 WON	 1987 1989	 BLACK	 Non-CXR Player	 n/a 1277 12/02/05	 g/90 2005 Nassif, Daniel F.
49579	 DRAWN	 2038 2035	 WHITE	 Non-CXR Player	 n/a 1967 12/04/05	 g/90 2005 Aceil, Javid M.
61419	 WON	 1977 1979	 BLACK	 B.Yuen	 7065-M 1000/P 01/15/07	 g/25 197 2007 Martin Luther King Scholastic Chess Tour. 61475	 WON	 1979 1981	 WHITE	 J.Llarenas	 81797-R 1180 01/15/07	 g/25 197 2007 Martin Luther King Scholastic Chess Tour. 61532	 WON	 1981 1983	 WHITE	 T.Padua	 81755-T 1087 01/15/07	 g/25 197 2007 Martin Luther King Scholastic Chess Tour. 61588	 WON	 1983 1985	 BLACK	 K.Achiu	 3653-D 1197 01/15/07	 g/25 197 2007 Martin Luther King Scholastic Chess Tour. 61644	 WON	 1985 1987	 BLACK	 T.Kaonohi	 1556-X 1489 01/15/07	 g/25 197 2007 Martin Luther King Scholastic Chess Tour. 61700	 WON	 1987 1994	 WHITE	 J.Iinuma	 1150-F 1633 01/15/07	 g/25 197 2007 Martin Luther King Scholastic Chess Tour. "Robert Lau is playing reasonably well. 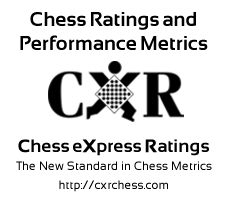 Robert has faced opponents with an average rating of 1557.8. Robert Lau has a winning streak of 11 games."